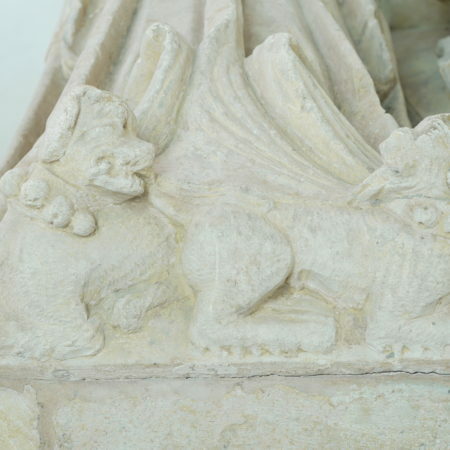 Among the fine tomb monuments in St Bartholomew’s church, Much Marcle, one in the north-west corner of a thirteenth-century chapel, known since the seventeenth-century as the Kyrle chapel, has tended to be overlooked. It is not in its original position. It was previously in the north aisle and before that in the middle of the chancel but that was not necessarily its original position. The monument is carved from Painswick stone from Gloucestershire and is probably a locally made product. It is in good condition, but has probably been ‘tidied up’ in a restoration at some time. 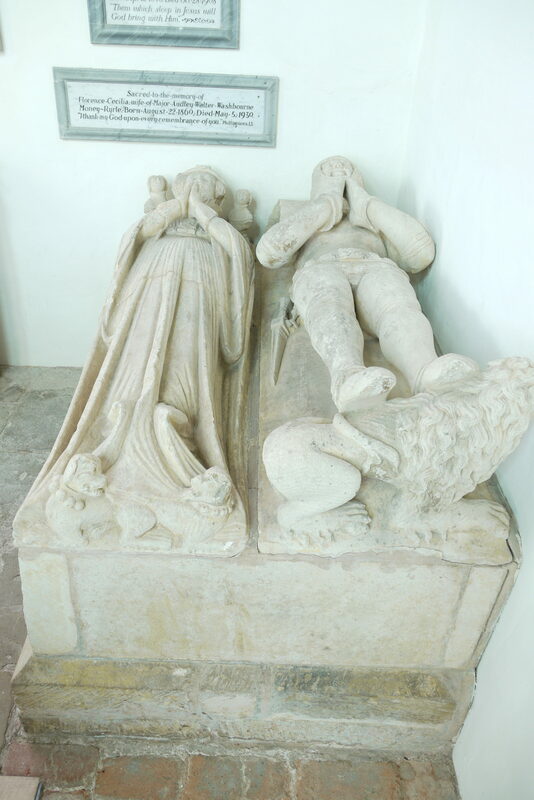 Two finely carved figures of a man in armour and his wife rest on a panelled tomb-chest. Two sides of the tomb chest can be seen, although it is entirely possible that carved panels are also on the sides against the walls. Rectangular panels decorated with shields suspended from brackets alternate with square panels with angels holding shields hung on straps around their heads. 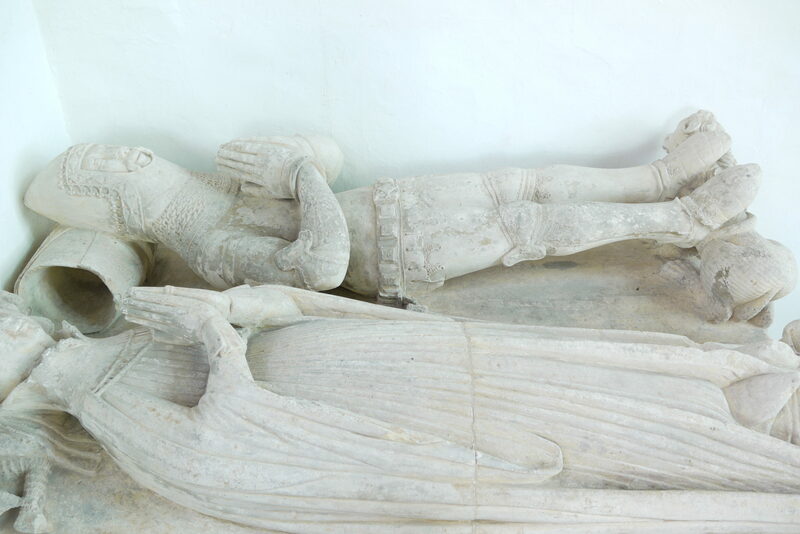 There was originally a fine heraldic display painted on them proclaiming the identity of the couple commemorated. However, all traces of paint have long since been scrubbed away and no record remains of what was once shown. 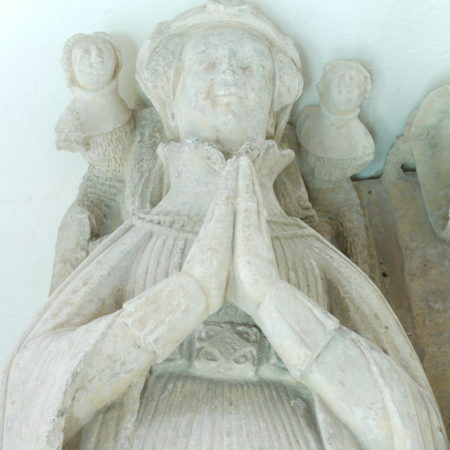 The monument has traditionally thought to be to Hugh, Lord Audley who died in 1325. However, it clearly dates from nearly a century later. 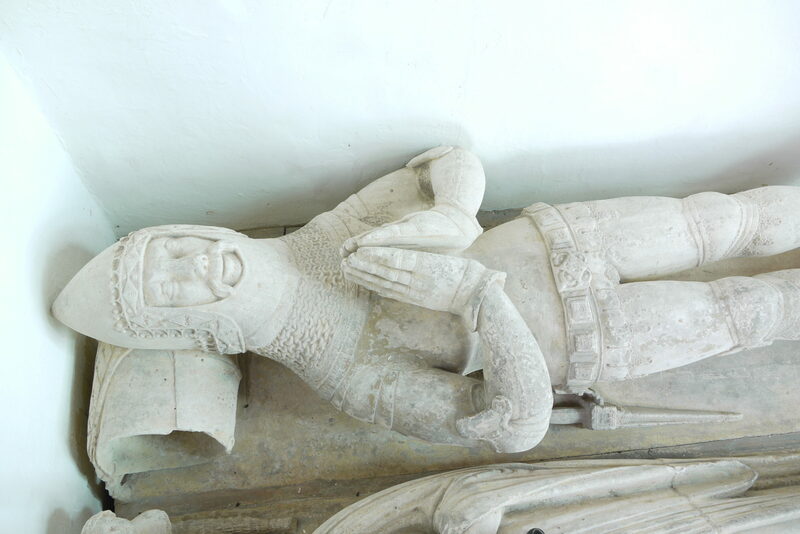 If it was a monument of c. 1325 the man would have been shown in a textile gown over mail, with very little plate armour, except perhaps to protect his elbows and knees. 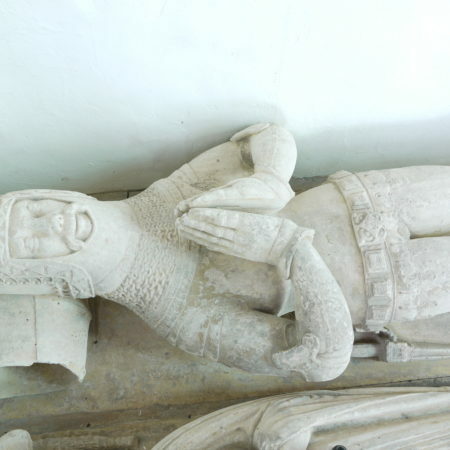 But the military effigy at Much Marcle wears plate armour consisting of two lame spaudlers, vambraces, couters with scalloped side-wings and two additional lames above and below, plate gauntlets, cuisses, greaves, sabatons and poleyns, which have a mail fringe below. Over the torso is a short, tight-fitting coat armour (a so-called jupon). The head is protected by a pointed basinet, while an aventail and gorget below protect the neck. This armour points to a date in the early-fifteenth century. 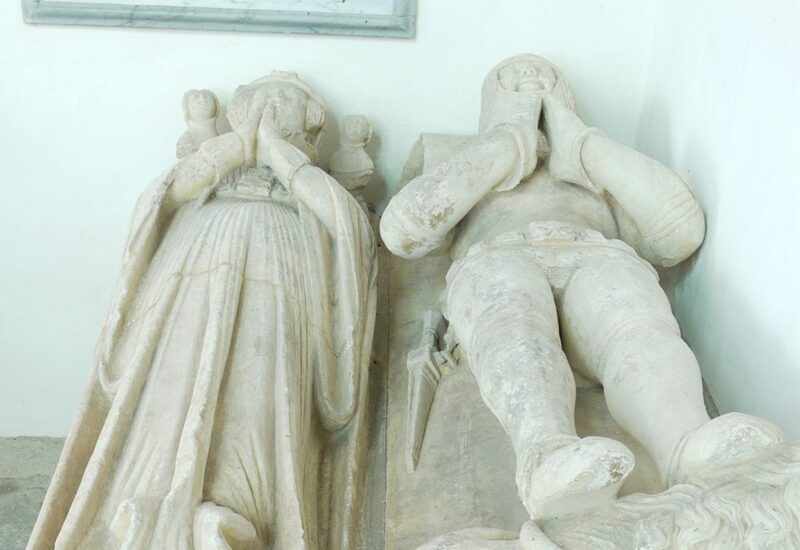 This dating is reinforced by the fact that early fourteenth-century effigies are usually shown cross-legged, but here the legs are straight. 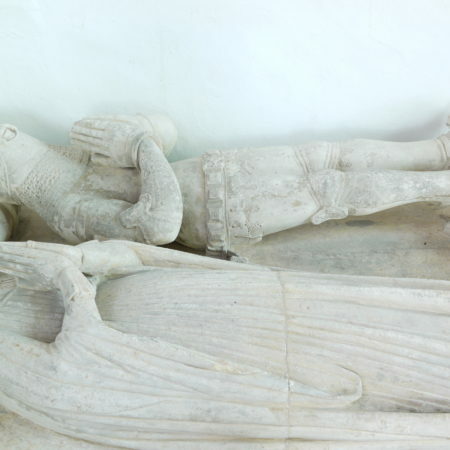 The lady’s dress is also wrong for a date of c. 1325. She wears a houpelande, which is gathered tightly under the bust, with wide hanging sleeves; this garment was fashionable c. 1380-1420. The houplelande shown here stands clear of the neck and opens slightly at the top, an early-fifteenth century development. Her hair is bound in cauls, with a padded circular roll shown on top. This was fashionable at the turn of the fourteenth and fifteenth centuries. 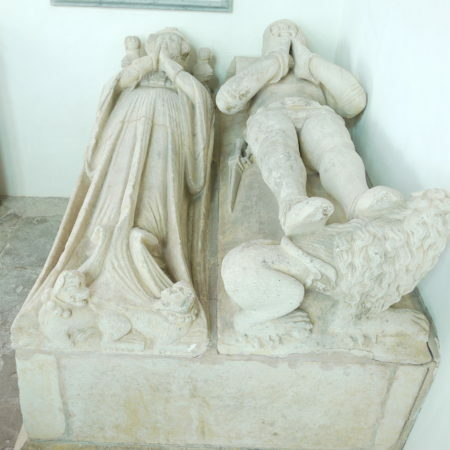 The most likely candidates for this tomb monument are Thomas Walwyn (d. 1415) and his wife, Isabella Hathaway. 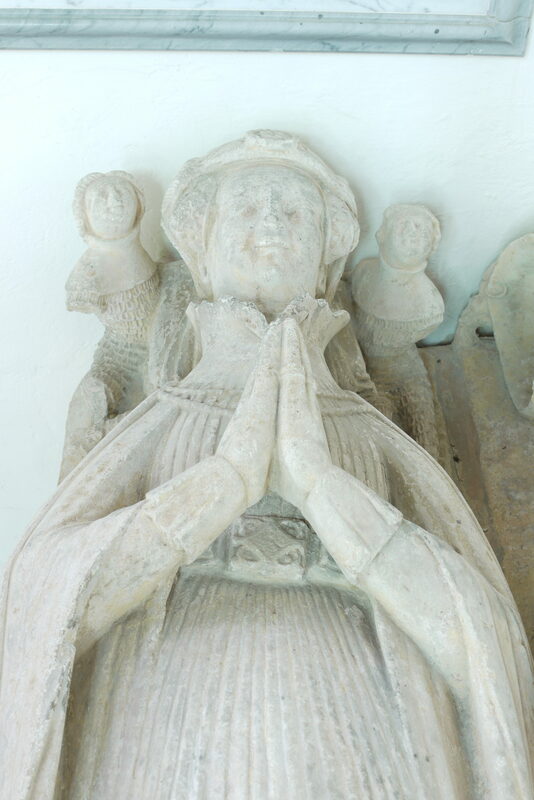 He was the elder son of Richard Walwyn of Stoke Edith and Johanna de Helyon, the daughter of Walter de Helyon, whose wooden effigy remains in Much Marcle church and from whom the couple inherited Hellens, a mansion in Much Marcle. Thomas died in 1415. His will is one of the earliest written in English. He asked to be buried in Much Marcle church, but made no mention of a monument, which could have been already prepared in his lifetime. He asked for some land to be sold; of the proceeds one third was used to fund the making of the steeple of Much Marcle church. The rest would be devoted to good works which would benefit his soul; in his case he chose poor prisoners, neighbouring poor and the marriage of young women. Thomas also left land to found a perpetual chantry in Much Marcle church. 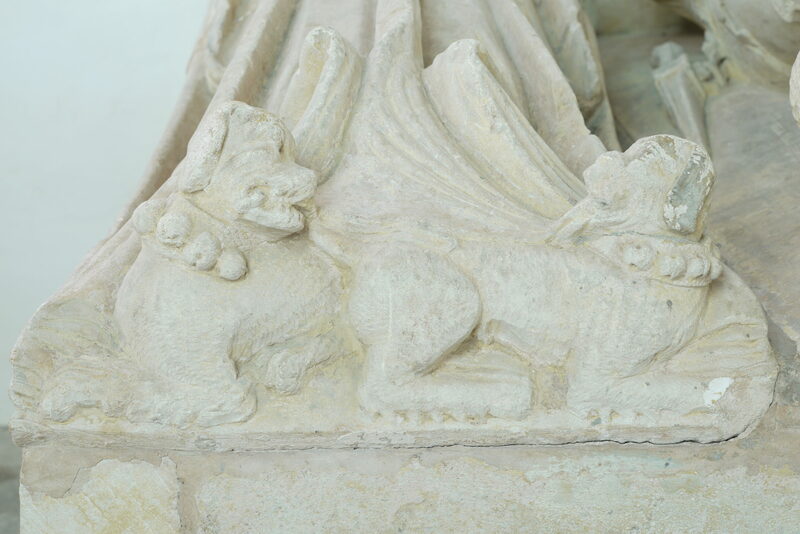 Where this chantry was located in Much Marcle church we do not know, although the Kyrle chapel is a possibility.